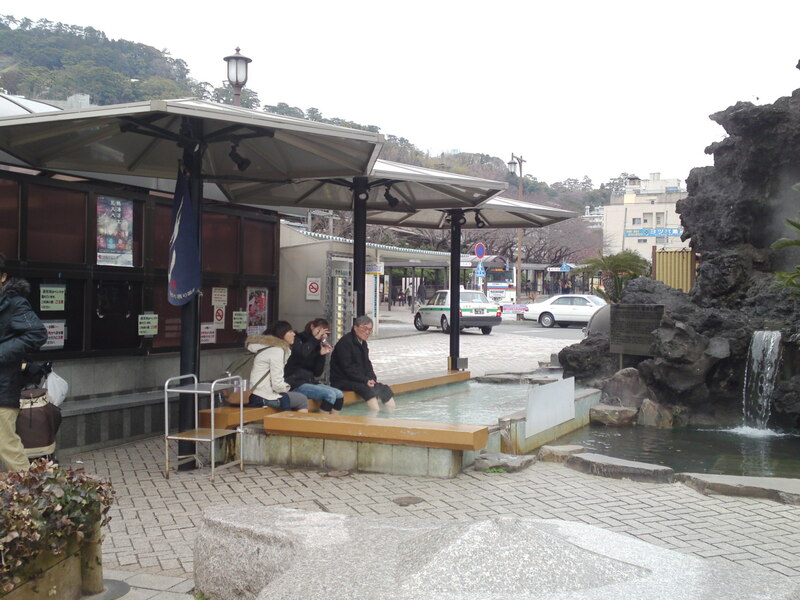 Hot Spring Foot Bath outside Atami Station! Initial plans called for the Japanese National Railways (JNR) to build a spur line linking Atami on the Tokaido Main Line with Shimoda. However, funding was limited in the 1930s due to a combination of a tight fiscal policy under Prime Minister Osachi Hamaguchi during the Great Depression, and a number of technical issues. The projected route of the Itō line along the mountainous east coast of the Izu Peninsula required numerous tunnels and bridges. Workers digging a tunnel near Usami encountered problems with underground hot springs, similar to that experienced in the construction of the Tanna Tunnel, which had recently been completed years later than originally projected and far over budget. On March 30, 1935, the initial 8.7 km section of the Itō Line linking Atami with Ajiro was opened. The second (8.3 km) section from Ajiro to Itō was opened on December 15, 1938. Both sections were electrified at 1,500 V DC when opened. Further work was delayed, and then canceled due to the outbreak of World War II. CTC signalling was commissioned in 1958, and the Atami to Kinomiya section was duplicated in 1968. The entire line was originally designed to be built as double track, and earthworks were undertaken on this basis, including tunneling, but to date only the first 1.2 km of the line has been duplicated. Construction south of Itō resumed in 1961, when the private-sector Tokyu Corporation acquired the rights to complete the line to Shimoda and established the Izukyu Corporation to manage construction and operations of this section. 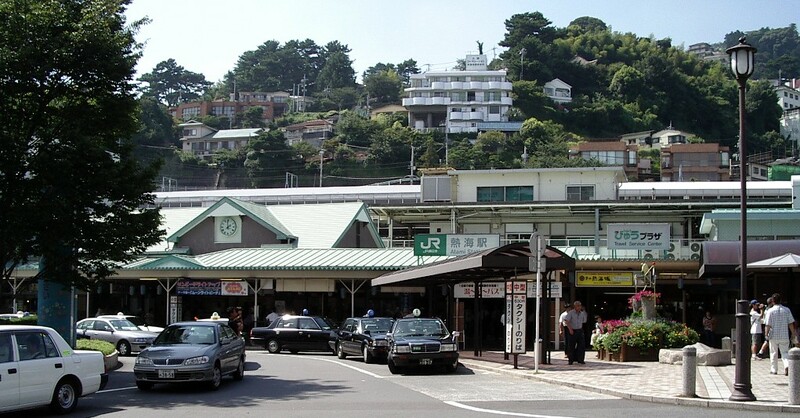 Atami Station (熱海駅 Atami-eki) is a railway station in Atami, Shizuoka, Japan, jointly operated by East Japan Railway Company (JR East) and Central Japan Railway Company (JR Central). The area around the Kinomiya Station is landfill, from the previous rubble formed by the digging of the Tanna Tunnel. Kinomiya Station opened on March 30, 1935 when the section of the Itō Line linking Atami with Ajiro was completed. On April 1, 1987 along with division and privatization of the Japan National Railway, East Japan Railway Company started operating this station. The CTC center of the Itō Line used to be located at Kinomiya, but along with its renewal to one that includes the controller of tracks at Atami Station in autumn of 2006, it moved to Atami. The Tōkaidō Main Line runs parallel to the Itō Line through Kinomiya Station, but only Itō Line has a station at this location. The 0-km indicator of the Itō Line is located at this station, although the Itō Line “officially” starts at Atami. Kinomiya Station has a single island platform. The station building has automated ticket machines and Suica automated turnstiles, but its “Green Window” service counter was closed in 2007. 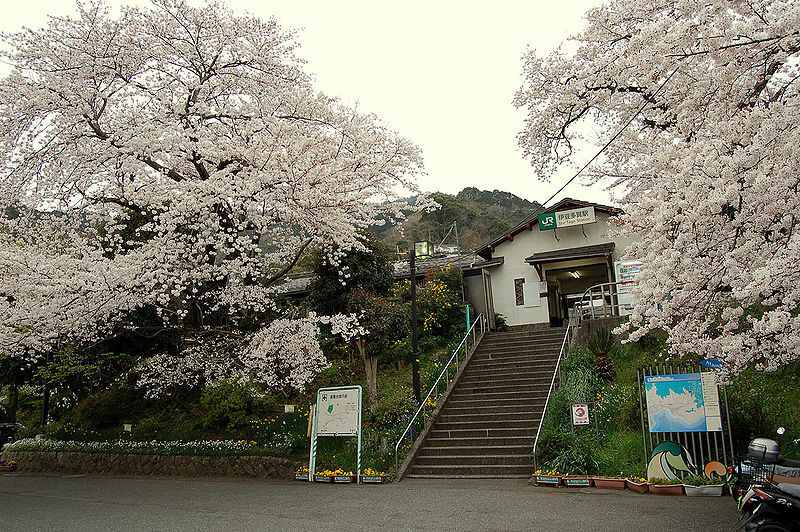 Izu-Taga Station opened on March 30, 1935 when the section of the Itō Line linking Atami with Ajiro was completed. Freight services were discontinued on November 1, 1958. On April 1, 1987 along with division and privatization of the Japan National Railway, East Japan Railway Company started operating this station. Izu-Taga Station has two opposing side platforms, one of which is connected directly to the station building and the other connected via an underpass. The station building has automated ticket machines and Suica automated turnstiles, but its “Green Window” service counter was closed in 2007. 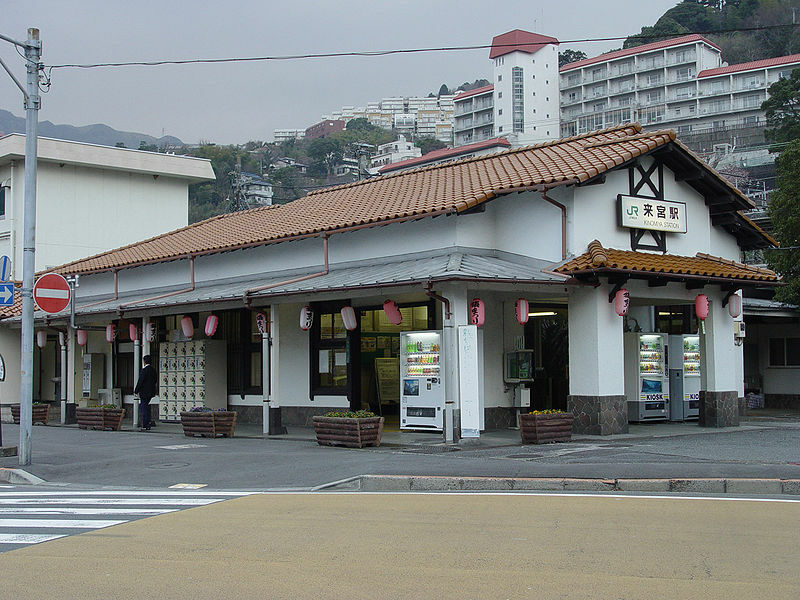 Ajiro Station opened on March 30, 1935 as the terminal station of the Itō Line from Atami; however, the line expanded to Itō Station by December 15, 1938. Freight services were discontinued on January 30, 1963. On April 1, 1987 along with division and privatization of Japan National Railway, East Japan Railway Company started operating this station. Ajiro Station has a ground-level island platform. The station building has automated ticket machines and Suica automated turnstiles; its “Green Window” service counter is open between 9:00 and 18:00. 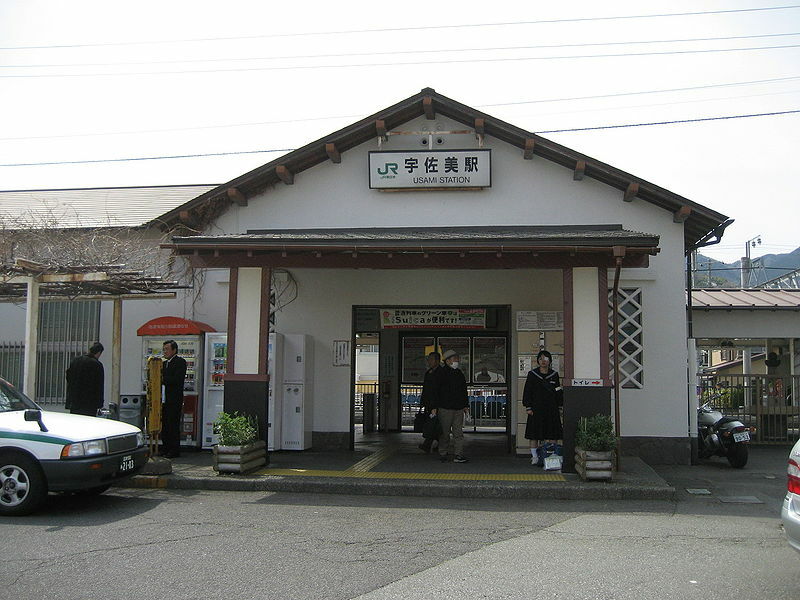 Usami Station opened on December 15, 1938, when the section of the Itō Line linking Ajiro with Itō was completed. Freight services were discontinued on November 1, 1958. On April 1, 1987 along with division and privatization of the Japan National Railway, East Japan Railway Company started operating this station. Usami Station has two opposing side platforms. The station building has automated ticket machines and Suica automated turnstiles, but its “Green Window” service counter was closed in 2007. 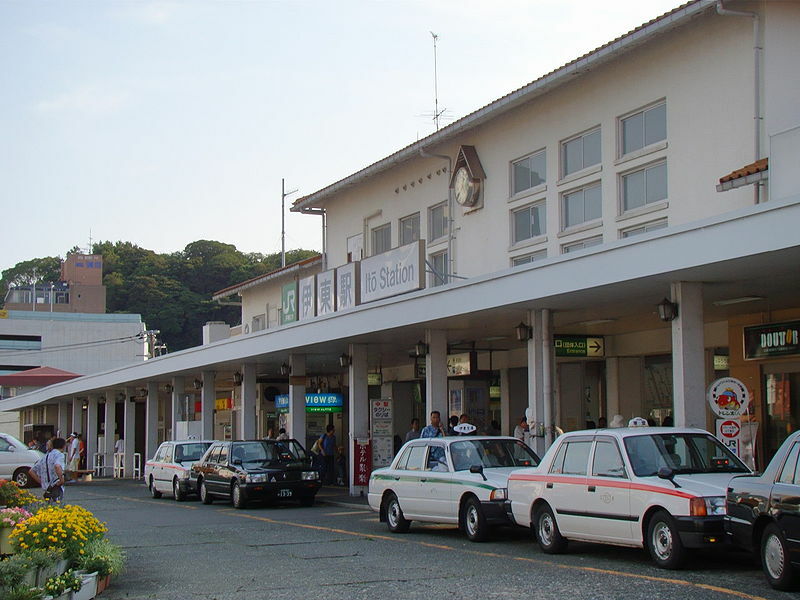 Itō Station (伊東駅 Itō-eki) is a railway station located in the northern part of Itō, Shizuoka, Japan. 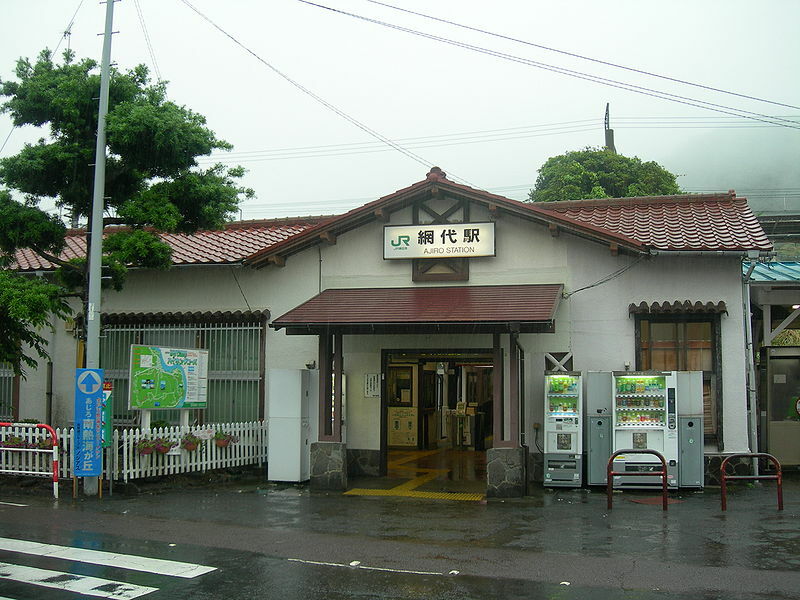 It is the terminal station for the Itō Line of the East Japan Railway Company and the Izu Kyūkō Line of the Izukyū Corporation, as well as a freight depot for the Japan Freight Railway Company.